Thousands of musicians and colleagues around the world continue to remember Bob Moog today. As I observed today on Gizmodo, it’s hard to find a picture of Bob alone. He’s always got a smile from ear to ear, and a musician or colleague (or two or three) in his arms. Music technology writer colleagues of mine are all wondering what shows like AES here in New York this October will be like without his presence. 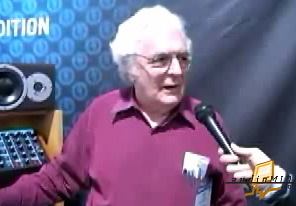 Public relations veteran Marsha Vdovin recalls how surprised she was when she saw the “father of synthesis” busily helping set up the Moog booth at a trade show. He was always humble, always hands-on as a representative of the company he built, from his first Theremin models to today’s latest Voyager keyboards. I’ll continue to collect memories and thoughts, for anyone who wishes to send them.